Starting with Europe, we can see that Chrome dominates, with 44.5% of the market. I think it’s safe to presume that most of these come from Android devices, and the ‘stock’ Android browser (I know, there’s no such thing) adds another 16.5% to that share. Safari, on iOS, is the second most used mobile browser in the region, with a 27.6% share. 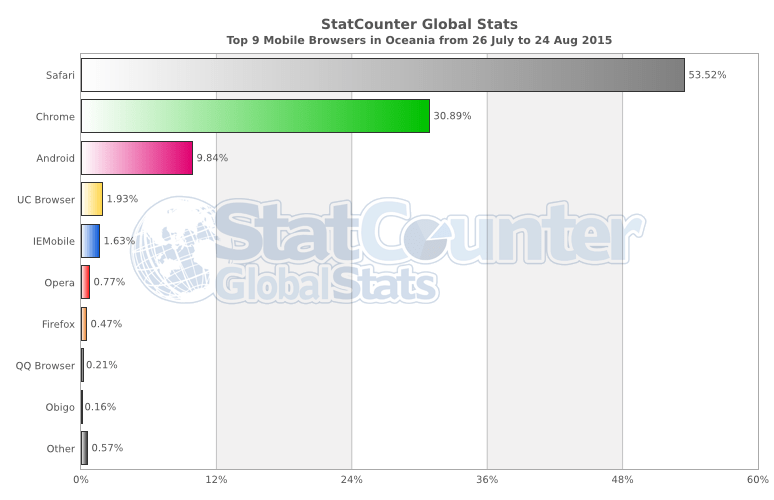 IE Mobile and Opera run a distant fourth and fifth, respectively. Sitting in seventh place with a 1% share – lower even than Blackberry – is UC Browser; I’d imagine most people in this region probably won’t have heard of it, but it’s much bigger in other markets, as will be shown shortly. In North America it’s somewhat different. Chrome drops to second place with 39.2%, and even combining that figure with the Android browser’s 9.2% only barely exceeds Safari’s dominant 45.5% in this continent. 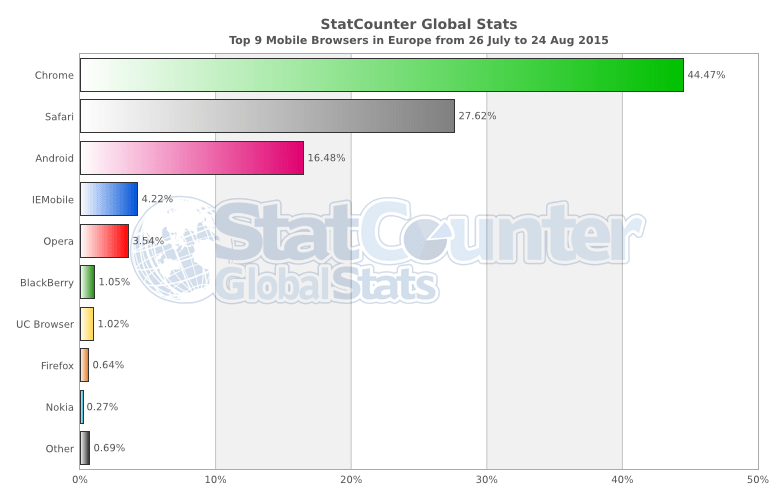 IE Mobile and Opera again round out the top five, but with less than half the share they own in Europe. 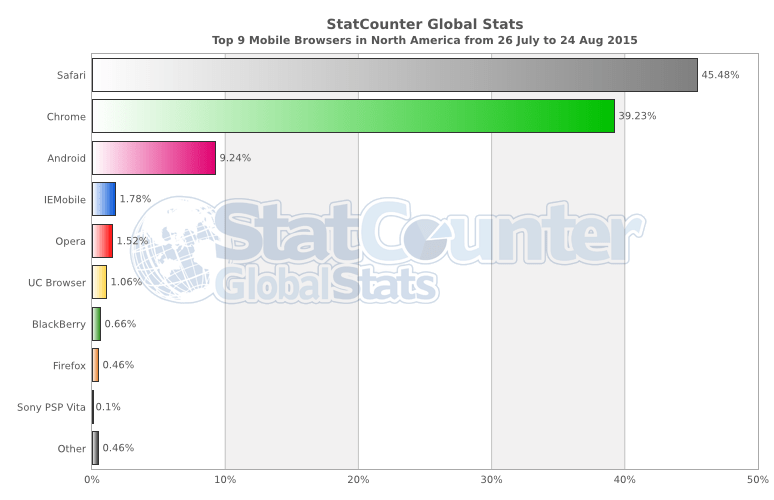 UC Browser beats Blackberry, but still struggles to gain slightly over 1%. Oceania’s story is quite similar, although here Safari has an even more dominant 53.5% share, much better than even Chrome’s 30.9% and Android Browser’s 9.8% combined. 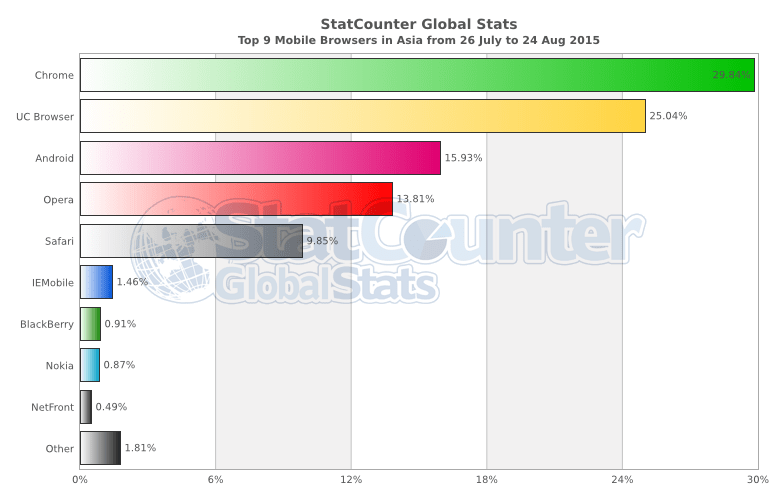 UC Browser does a little better with 1.9%, IE Mobile is in fifth with 1.6%. Opera is almost invisible here. In South America, Android is even more dominant than in Europe. Chrome has 52.7% share, and Android Browser, 20.4%. Safari gets just 11%, above Opera with 6.8%. IE Mobile has its largest share in any market, with 5.2%, while UC Browser gets 2%. The first big variance from the Android / Apple duopoly comes in Asia. Chrome still has the biggest share with 29.8% and Android Browser is third with 15.9%, but second place is taken by UC Browser with 25% share — its largest in any market. UC Browser uses data compression on images, videos and other assets, a valuable service in parts of Asia where network connectivity is patchy and data plans can be expensive. Opera, which also has advanced data compression features, does well here too, with 13.8% of the market. Safari comes in fifth with 9.9%. The biggest outlier is in Africa, where Opera has an enormous 58.7% share, again due to the importance of its data compression features in countries with variable or limited access to network and data. 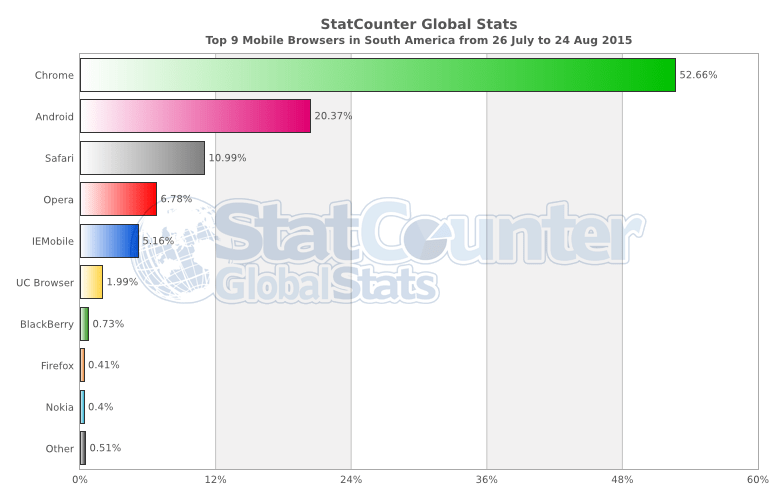 Chrome and Android Browser come a distant second and third with 15.2% and 9.6% respectively. 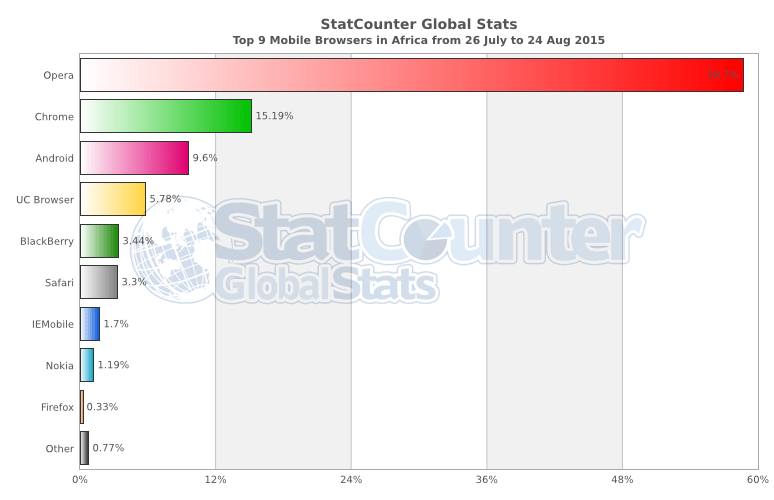 Africa provides UC Browser with its second‐highest share in any market: 5.8%. Blackberry’s 3.4% share narrowly beats out Safari’s 3.3%, its lowest showing in any market. What conclusions can we draw from these statistics? Firefox is a lame duck on mobile, not managing even a single percentage point in any market. IE Mobile fares better, but not much; while I’m surprised that Blackberry still manages single figures in some markets. If you take only one lesson from these figures, it’s that if you’re making a website for a global market you should really be testing on Opera and UC Browser, especially their proxy editions.